Bare arms and a belted waist, a White House vegetable garden and parents in the residence: Melania Trump is borrowing pages from Michelle Obama's playbook. 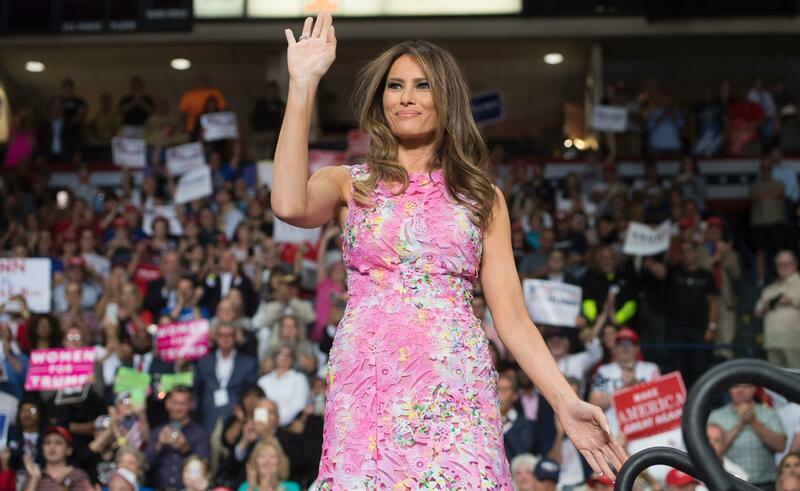 From public policy to high fashion to family ties, Mrs. Trump is keeping alive parts of the former first lady's legacy even as President Donald Trump's administration alters other aspects. Mrs. Obama made it acceptable for first ladies to shun the confining, jewel-toned suits that her predecessors wore like uniforms, and her successor is embracing that same free-wheeling fashion sense. During President Trump's first overseas trip in late May, the current first lady stepped off of Air Force One in Saudi Arabia wearing a long-sleeved, black jumpsuit accented with a wide, gold belt. A former model, Mrs. Trump has worn a number of sleeveless and belted outfits since, almost always paired with towering heels. She has kept Mrs. Obama's vegetable garden, and shown interest in women's empowerment, military families and children's issues. Mrs. Obama championed all as first lady. But where Mrs. Obama frequently hosted public events in the garden to encourage healthy eating, Mrs. Trump has yet to hold an activity there. Next month, Mrs. Trump will lead the U.S. delegation to the Invictus Games, an Olympics-style competition for wounded military personnel. The Obama White House helped promote the games after Britain's Prince Harry created them in 2014. On the family front, the first lady's parents — Viktor and Amalija Knavs — spent time at the White House after their daughter officially moved in in June. They spent Father's Day weekend with the Trumps at Camp David, the presidential retreat in Maryland. The Knavs live in New York and aren't expected to join their daughter in the White House. Mrs. Obama's mother, Marian Robinson, lived in the White House during the eight years that Barack Obama was president to help care for her granddaughters. "She really did admire Michelle Obama very much," Myra Gutin, a Rider University professor and author of "The President's Partner: The First Lady in the Twentieth Century," said of Mrs. Trump. "Maybe she's following in those footsteps and is expressing her admiration by doing things that, if they aren't the same, are similar." Admiration for Mrs. Obama's legacy is a bit harder to find elsewhere in the administration. In his first major act in office, Agriculture Secretary Sonny Perdue partially rolled back federal rules the former first lady championed as part of her healthy eating initiative. Schools now will have more time to cut the amount of sodium in meals. The department will also continue to waive the requirement that all grains served must be 50 percent whole grain. The Food and Drug Administration also has postponed introduction of a redesigned food label to help consumers quickly see how many calories and added sugars are in packaged foods and beverages. The agency also delayed a requirement for restaurants and grocery and convenience store chains to post calorie counts for prepared foods. Mrs. Obama had pushed for both changes. Stephanie Grisham, the first lady's spokeswoman, said Mrs. Trump has "great respect" for her predecessors and, when possible, considers their issues or projects and makes "her best effort" to continue them. "She is an individual with her own iconic style and has been staying true to herself in this new role," Grisham said. On the surface, the two first ladies wouldn't appear to have much in common. One is a Slovenia native and former fashion model who speaks several languages. She is the second first lady born outside of the U.S. The other is a native of Chicago's South Side, holds degrees from two Ivy League universities and was a lawyer and a hospital executive before she became the first black first lady of the United States. But the first ladies share at least one common interest: not to cause political headaches for their spouses. Jean Harris, who teaches political science and women's studies at the University of Scranton in Pennsylvania, said Mrs. Trump knows she can follow in Mrs. Obama's footsteps because "she's not going to get criticized for that kind of stuff because it worked for Michelle, even though her husband's administration is backtracking on some things." An early sign of Mrs. Trump's admiration for her predecessor came during her speech at last year's Republican National Convention, which included two passages that were similar to those in a speech Mrs. Obama had delivered at the 2008 Democratic convention. A speechwriter for Donald Trump's organization took the blame for the overlap, but said Melania Trump knew the material had come from Michelle Obama. "A person she has always liked is Michelle Obama," the speechwriter, Meredith McIver, said at the time. The current first lady's feeling toward her predecessor was reinforced months later in a tweet from then-President-elect Donald Trump following his Oval Office meeting with President Barack Obama. The outgoing and incoming first ladies met separately at the White House that day. Trump tweeted about the "really good meeting" and "great chemistry" he had with Obama and added: "Melania liked Mrs. O a lot!" Mrs. Trump took on a "mom in chief" role of her own, a la Mrs. Obama, by living at Trump Tower in New York for the first six months of the administration so that son Barron could finish the school year. Mrs. Obama had declared herself "mom in chief" after moving to the White House in 2009, saying her top priority was helping daughters Malia and Sasha, then 10 and 7, adjust to the move.